A short biography and F.A.Q. This site is dedicated to all the people like Don Herron, Bill Arney, Richard Layman, William F. Nolan, Josephine Hammett Marshall, Julie M. Rivett, Steven Marcus, Joe Gores and others who have kept 1920s San Francisco in the here and now. Special thanks to Vince Emery for his many helpful contributions to this website. Entire website © 2003-2012 by Mike Humbert. DO YOU HAVE ANY HAMMETT NEWS? If so, E-mail it to me, and if I use it on the website, you'll receive... uh, my sincere gratitude. (and a mention here in the news column, of course). Dan Saltzstein of the New York Times has put together a nice little piece on Hammett’s San Francisco, including moody photos by Matthew Ryan Williams. Click here to take a peek. Using a rich blend of images and video, Brad Rosenstein takes us down the foggy, mean streets of Hammett’s San Francisco, exploring how the city and the writer combined to shape the myths around each other, as Hammett produced some iconic American fiction. This event takes place on Thursday, March 20, at 7:00 PM at San Francisco’s Jewish Community Center, 3200 California Street (at Presidio Avenue). Ticket details can be found here. I’m not even sure when the actual anniversary was, but The Dashiell Hammett Website has been around for slightly more than a decade now! Many thanks to all the people whose support helped make this site what it is today! The Maltese Falcon – the 45-pound lead prop held by Humphrey Bogart in the 1941 film – went on the auction block yesterday. Many predicted that it would sell for a million dollars or more. As, it turned out, it brought more than four million! Click here for the mind-boggling details. Need to contact the people who control Hammett’s literary estate? Not a problem! Inquiries relating to films or to Hammett’s five novels should be directed to Gelfman Schneider Literary Agents (cathy@gelfmanschneider.com ). Questions regarding Hammett’s short stories should go to the Joy Harris Literary Agency (adamreed@jhlitagent.com). Please send copies of all inquiries, as well as any to other questions, to Hammettqueries@gmail.com. The Los Angeles Visionary Society (LAVA) will welcome Julie Rivett, Dashiell Hammett’s grand daughter as she explores her grandfather’s controversial political life, his relationship with Lillian Hellman, and the decades of consequent troubles that have tangled Hammett’s estate. The event takes place April 27, which includes a buffet dinner featuring mid-century gourmet fare, the presentations, and complimentary parking. For more details, click here. Shane Mawe, a longtime contributor to this site, reports that Hammett has once again surfaced as a fictional character in a novel. This time it’s in Hammett Unwritten (more details can be found here). The book was (supposedly) written by Owen Fitzstephen, who was a fictional character in the Hammett novel The Dain Curse. Hammett’s latest: Return of the Thin Man is now in bookstores, and available from amazon.com. As a tie-in, Publishers Weekly interviewed Julie Rivett (DH’s granddaughter) , who revealed what her grandfather thought of writing for Hollywood. To read the interview, click here. To coincide with Otto Penzler’s publication of two lost Dashiell Hammett novellas—“After the Thin Man” and “Another Thin Man”—HighBridge Audio is releasing an audio edition: The Return of the Thin Man. The audiobook is narrated by Peter Ganim, Nicola Barber, Scott Brick, and a full cast, and produced and directed by Paul Ruben. Check out the AudioBook Trailer from HighBridge. 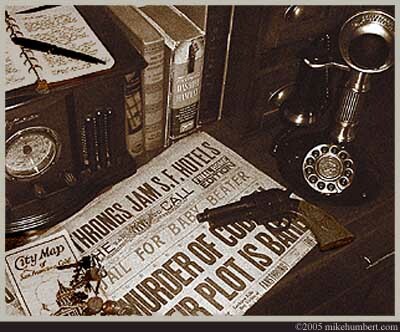 When Library of America assembled Hammett: Crime Stories and Other Stories back in 2001, they intended to use the original, pulp magazine versions of Hammett’s stories (rather than the edited and altered versions that usually appear in collections). This is what they did—with one exception. As far as anyone knew, there were no surviving copies of Mystery Stories (January 1928 issue), in which the Continental Op story “This King Business” originally appeared. But copies of the issue in question have resurfaced, so the latest printing of Crime Stories will include the original pulp version. For details aplenty, click here. Debra Levie has a question about the Adventures of Sam Spade radio episode “The Wheel of Life Caper.” At one point, a gunman says “In a goop!” As a cop hauls the creep away, Spade responds “In a goop to you, too!” In context, the expression seems to mean “to hell with you, buddy,” but Debra’s never found “in a goop” in any slang dictionary, nor located anyone who’s familiar with the expression. Can anyone offer enlightenment? If you’d like to see six Hammett-inspired films on the big screen, all in one day, attend the closing day of Noir City X, Eddie Muller’s tenth annual tribute to film noir. Ten days of hard-boiled cinema will climax on Sunday, January 29 with a Hammett marathon that includes Roadhouse Nights (1930, based loosely on Red Harvest), The Maltese Falcon (the 1931 original, starring Ricardo Cortez as Sam Spade), City Streets (1932, written by Hammett), Mr Dynamite (1935, story by Hammett), The Glass Key (1942, based on Hammett’s novel) and, of course, Humphrey Bogart in 1941’s The Maltese Falcon. It all starts at noon at San Francisco’s world-famous Castro Theatre. Author Nathan Ward is currently researching a book on DH’s transition from Pinkerton op to hard-boiled writer. As an epilogue to the book, he hopes to include personal anecdotes from readers who feel that Hammett’s work has impacted their lives. Nathan would especially like to hear from people who were involved in the Hammett revival in San Francisco during the early 1970s. If you have something you’d care to contribute, contact him at nathanaward@mac.com. Here’s something wacky: imagine the opening scene of The Maltese Falcon redone as a TV sitcom, complete with a cheesy theme song and a live studio audience. Actually, you don’t have to imagine it: just click here to check out this short film made by students of the University of Technology, Sydney. I just learned of the June 7 passing of Dr. George J. “Rhino” Thompson. The often-quoted author of Hammett’s Moral Vision was 69. “Doc” also founded the Verbal Judo Institute, which has trained countless law enforcement officers in the art of “tactical communication.” Click here to read my 2007 interview with this fascinating individual. At 2 PM on November 13, The Friends of the Pomona Fox will screen The Maltese Falcon at the Pomona Fox Theater, Garey & Third Street, Pamona, CA. In addition, writer Denise Hamilton will speak about film noir. Tickets can be purchased online by going to www.pomonafox.org or can be purchased in person at the Pomona Public Library, or even at the Palomares Park Recreation Center office. Tickets are five bucks a pop (kids 12-and-under are only $3.00) Cash and checks are the only form of payment they accept, so leave your jewel-encrusted statuettes at home. The Maltese Falcon: The name of a certain black-enameled statuette. Also the name of the world’s largest yacht. And now—an atheletic shoe?? According to the manufacturer, the Maltese Falcon is a“low-cut, SPD shoe built for the demands of mountain biking, BMX and Dirt Jumping. The new Maltese Falcon has a stiff but sensitive midsole for cranking power—and we’ve added a Velcro® Brand ankle strap for extra support.” Okay. Actor Johnny Depp and director Rob Marshall are ready to cinematically remake Hammett’s The Thin Man. Actually, “ready” may be too strong a word: several writers have come and gone from the production, and Depp’s other pet project (a Lone Ranger reboot) has recently fallen through. Will Nick & Nora return to the big screen? Stay tuned! Sam Spade appears live onstage in the form of actor David “Oz” Oswald. The Crowded Kitchen Players’ production of Dashiell Hammett’s The Maltese Flacon will be playing through October 9 in Quakerstown, PA. More details can be found here. Shane Mawe (always a reliable source of Hammett info) reports that the USPS will soon be issuing a postage stamp honoring ohn Huston, director of The Maltese Falcon. The stamp features a portrait of Huston, with Sam Spade holding the black bird in the background. Click here for more details. Publisher Vince Emery took time out of his hectic schedule to pass along this audio link to KALW radio, which is about Hammett in general and his recently: discovered stories in specific. (There is also a transcript of the audio on the same page.) Thanks, Vince! Don Herron (who leads the Dashiell Hammett tour up and down the mean streets of Frisco) has recently revamped his website, which now features a terrific blog. Just added this evening: a fascinating article about Hammett’s days as a Pinkerton strikebreaker, including an rare photo from the period. Clicking here will take you to Don’s site. Attention, residents of Charlottesville, VA: The Maltese Falcon, starring Humphrey Bogart as Sam Spade, is returning to the big screen! It’s happening at the historic Paramount Theatre on March 7, 2011. The show starts at 7 PM, and tickets are a mere six bucks! Click here for more details. Strand Magazine is now accepting pre-orders for the upcoming issue, featuring a never-before-published Hammett story (entitled “So I Shot Him.”). Click here to order your own copy! Parlez–vous Hammett? Publishing whiz Vince Emery passed along this link showing a variety of French-language Hammett novel covers. Take a look! NEW YORK (AP) — Case closed: An unpublished Dashiell Hammett story is coming out decades after his death. "So I Shot Him," a 19-page crime thriller written in the clipped style Hammett made famous in The Maltese Falcon and other works, will appear in the winter/spring issue of Strand Magazine, managing editor Andrew F. Gulli said Thursday. The issue comes out Feb. 28. Gulli found the undated story, and 14 others by Hammett, while looking through archives at the University of Texas in Austin. The Strand, a quarterly based in Birmingham, Mich., has recently published little-known works by Graham Greene, Mark Twain and Agatha Christie. It is with sadness that I must report the passing of Joe Gores, author of Hammett (1975) and Spade & Archer (2009). He died fifty years to the day after Dashiell Hammett, On January 10. Mr. Gores was born in 1931 and was educated at Notre Dame University and Stanford University. Like Hammett before him, he worked as a San Francisco private investigator. He won three Edgar Allan Poe Awards (best first novel, best short story, best TV episode) as well as Japan's Maltese Falcon Award. Mr. Gores's memorial mass will be held Friday, January 21 at 11:30 AM at St Sebastian Catholic Church, 373 Bon Air Road (corner of St. Francis Blvd.) in Kentfield (near Greenbrae), California. To read the obituary that appeared in the San Francisco Chronicle, click here. “Perhaps of interest to Hammett fans is Turner Classic Movies' premiere showing of City Streets (1931) on Friday, January 21, 8 PM (Eastern), 5 PM (Pacific) with an encore screening on Saturday, March 12, 1:15 AM (Eastern), Friday, March 11 10:15 PM (Pacific). As far as I know, this is the first time this film has ever been shown on TV and is part of TCM's "Early Gangster Films" block of screenings on the 21st.” For more information, click here. Today marks the fiftieth anniversary of Dashiell Hammett’s death in 1961. Of course, by the early 1960s, his glory days as a writer were long over. His health was shattered and his money had all been squandered or seized by the IRS. Click here to read Hammett's obituary as it appeared in the Los Angeles Times. As many Hammett fans know, page 192 of Dashiell Hammett’s The Thin Man (page 192 of the original hardback edition, anyway) contains a certain “five word question” that shocked the sensibilities of 1930s readers. So how did the publisher smooth over the controversy? By taking out an ad to draw more attention to it, of course! Blogger Stephen Altobello has managed to track down the original ad (it was in the January 30, 1934 edition of The New York Times). In addition, Stephen has written a pretty nifty column about the scandalous “five word question.” Click here to see the ad and read the blog! Remember at the end of The Maltese Falcon, when Casper Gutman carves a sliver of enamel from the base of the “black bird” to reveal that it’s actually made of… chocolate??? Okay, maybe not, but it’s a way of leading into this item concerning an actual chocolate falcon (sculpted by Hazel Hill) as part of the Big Read program in Topeka, Kansas. Click here for the creamy details. Somewhere Casper Gutman must be shedding a tear. A group of investors that included billionaire Stewart Rahr and Leonardo DiCaprio (!!!) placed the winning bid of $305,000 for that resin falcon that was used in publicity shots for The Maltese Falcon back in 1941. (See September 17th's entry below). If you live in the Topeka area, you’ll have the opportunity to meet and talk to Richard Layman, a man who knows as much about Dashiell Hammett as anyone alive. Rick will be conducting an informal talk and Q&A session at the Topeka & Shawnee County Public Library on October 17th at 3PM. A quick click here will bring additional info. As of today, you can own a copy of what is arguably Hammett’s most influential work—even though it hasn’t been available for over eighty years! The original text of The Maltese Falcon (serialized in Black Mask magazine back in 1929, which reportedly has “thousands of differences” from the 1930 novel) is included in The Black Lizard Big Book of Black Mask Stories, a new 1136-page collection, edited by Otto Penzler. To find out more, click here. Here’s your chance to own “one of the most important and recognizable objects in the history of cinema:” one of the original resin falcon statuettes from the 1941 movie of The Maltese Falcon. Weighing 4 pounds, 5.4 ounces and standing 11 1/2 inches tall, it turned up in New Jersey several years back. The consensus is that this resin bird is indeed the falcon that appeared in several 8x10 publicity photos, in the hands of Humphrey Bogart. Oh, by the way—you’ll need at least $150,000 for your opening bid! Details may be found by clicking here. Have you ever wanted to be Sam Spade? Well, you can’t—but if you live in Sandy, Utah, you might be able to come close. Auditions for Hunt Mysteries Christmas season show Hammer Spade is September 16, 7-9PM at Spaghetti Mama’s in the Jordan Commons complex. The show will perform November thru January in the Salt Lake Valley, mostly at Spaghetti Mama’s. The title character is Hammer Spade, private eye, and is a blend of Humphrey Bogart in The Maltese Falcon and Elliott Gould in The Long Goodbye. For more details on how to audition, click here. “It all began Thursday afternoon when I entered my office and, discovered a tall, wild young man sitting in my chair with his feet up on my desk and sampling my office bottle. The pose was so familiar, for a minute I thought it was me.”—so says detective Sam Spade, who will be portrayed onstage the evening of Tuesday, September 21. Beowulf Alley Theatre’s Old Time Radio Theatre Company will present “The Flopsy, Mopsy and Cottontail Caper,” adapted from a 1949 radio episode of The Adventures of Sam Spade. Also on the bill is a re-enactment of a Burns & Allen Show from the same year, entitled “The Sam Spade Episode.” The theatre is located at 11 South 6th Avenue, downtown Tucson. Additional details may be found by clicking here. The Phoebe Griffin Noyes Library in Old Lyme, Connecticut will host a discussion of Hammett’s novel Red Harvest. It’ll happen at 7 PM on September 7, and is part of the free series of book discussion programs, “Literature for a Lifetime: The Mystery Novel As a Reflection of its Times.” Click here for more details. This item comes from Julie Rivett (Hammett’s granddaughter): If you’re going to be in Beverly Hills on the evening of September 13, make a point to see The Maltese Falcon on the big screen for a mere five bucks! It’s all part of the Oscar Noir Encore program, put on by no less that the Academy of Motion Picture Arts and Sciences. For more details, click here. This isn’t strictly Hammett news, but you’ll want to know this anyway: Bill Arney (who was until recently the resident of Hammett’s Post Street apartment, and is also the voice of the Noir City film festival) has now reinvented himself as a TV star! He’s now the host/creator of Cheese Theater, a hilarious new series that features cheesy old movies and snarky commentary. Even though it’s on cable TV in the Marin County area, you can still watch it by by clicking on this link every Saturday night at 10 PM (Pacific time). Episode three airs tonight, so check it out! Lavanya Jayashankar of Singapore wants us to know about The Mammoth Book of Best Crime Comics, edited by Paul Gravett, which includes “a lengthy continuity from Dashiell Hammett's newspaper strip Secret Agent X-9, with art by the great Alex Raymond!” It’s available on Amazon.com. Thanks for the tip, Lavanya! Attention Hammett fans in Montana: the Clark Fork Chronicle reports that the Missoula Public Library will be giving out more than 2,200 copies of The Maltese Falcon, thanks to a grant from the National Endowment for the Arts. In addition, the library is partnering with multiple community groups and businesses to hold six weeks of Maltese Falcon programs Oct. 5-Nov. 13. “This is a chance for everybody in the area to read the same book at the same time,” says the paper’s website. “Big Read programs have been popular all around the country, bringing together residents in a common experience—one that encourages reading, community involvement, and is a lot of fun besides.” Missoula is one of 268 communities nationwide participating in The Big Read this year. According to the Ottawa Citizen, look for Warner Brothers to release the Bogart version of The Maltese Falcon on Blu-Ray this coming October. “The bonus features are pretty much the same as they were for their snazzy DVD editions, but those were quite extensive,” reports the Canadian publication. For those of you in the San Francisco Bay Area, you won’t want to miss hearing Mark Coggins (author of the August Riordan mysteries) at the Montclair branch of the Oakland Public Library (1687 Mountain Blvd). Mark will be speaking on “80 Years of Mystery” and the place Hammett’s Maltese Falcon holds in the crime fiction canon. It all happens Saturday, May 22nd at 1:00 PM. For complete details, click here. Marlboro (Vermont) College is currently staging The Maltese Falcon, directed by Joshua Moyse. For some behind-the-scenes photos, click here. Yuri Rasovsky informs us that Blackstone Audio's Maltese Falcon dramatization has been nominated for three Audie Awards (which are bestowed by the Audio Publisher Association). The nominations are in the categories of Best Audio Drama, Best Adaptation and Achievement in Production. The winners will be announced May 25.